We have finally hit the Pacific time zone in our quest to complete all 30 Q&A’s. It has not been an easy process but hey, nothing ever comes easy. Today, we talk to Ian Gooding of Today’s Slapshot about the Vancouver Canucks. He steps into the hot seat with plenty to say and nothing to hold back. Here are his answers and enjoy. 1. It started off so promising last year. What about the Calgary brawl derailed the 2013-14 campaign so badly? Was it even that brawl and skirmish afterwards? Many believe that the Calgary opening-faceoff brawl was the turning point to the Canucks season. Actually, the Canucks had lost three consecutive games and eight of their previous nine games before the brawl. Included in the losing streak was a 1-0 loss in Los Angeles, a game that many Canucks fans called a “moral victory”, as the Canucks delivered an edge of nastiness to their game to match the normally physical Kings. Whatever moral victory the Canucks had accomplished had vanished two nights later in Anaheim, where the Canucks were pounded 9-1. After a 1-0 loss in Phoenix the next night, John Tortorella and the Canucks needed to take their frustrations out on somebody. Needless to say, the brawl caused the Canucks to lose a head coach for 15 days, and the head coach himself lost much of his credibility with the fans after that incident. The Canucks actually managed to win that game against Calgary, but the season was slipping away by that point, with a promising December just a distant memory by mid-January. 2. Could you ever believe that the Sedin twins had regressed so badly? What was most shocking about it? The Sedins were already on a downward trend before last season, regressing to less than a point per game after having scored 100 points each a few seasons ago. But no one expected that the Sedins would fall off the map for as long as they did last season. To give you an example, Henrik had one stretch where he had just one point over 15 games, and Daniel had a similar one-point stretch over 18 games! Granted, both Sedins battled injuries last season, which may have been caused by Tortorella deciding to overuse them earlier in the season. 3. The Vancouver Canucks have gone from Roberto Luongo to Cory Schneider to Eddie Lack to Ryan Miller and yet it has worked out so far this year at least. Is this the Miller we expected in St. Louis? I have told those who have asked that Miller is a good goalie, but not a great one. Sure, Miller disappointed in St. Louis, particularly in the playoffs, but one only needs to look at his .923 save percentage in Buffalo last season to see if he still has it. If not for Miller, the Sabres may have been the worst single-season team in NHL history last season. It’s a small sample size, but so far Canucks fans have to be happy with the play of their new keeper. 4. Alexander Edler looked more like himself over the weekend against Tampa Bay? Should we expect the Edler of three years ago or last year, or a mixture of both? As much as the Sedins’ point totals dropped off dramatically with Tortorella last season, no player’s production was hurt more by the Tortorella effect that Edler. We’re talking about a -39 for a player who had never been worse than a -5 in his career. It’s fair to say that Tortorella damaged Edler’s confidence, as Edler often looked lost and out of place last season. We will need to wait and see to find out whether that damage was permanent. But so far Edler has looked fine. He may never reach 50 points, but he’ll be a lot better than what he showed last season. 5. Undoubtedly Radim Vrbata was the Canucks biggest offensive signing. What makes Vrbata’s chemistry with the Sedin twins look so easy? From what I’ve seen, the one element that stands out about Vrbata’s game is his quick release wrist shot. If there’s one frustration with watching the Sedins, it’s that they are pass-first players. Alex Burrows was an effective complement on the Sedin line for a few years because he likes to shoot. So does Vrbata – in fact, even more so than Burrows, as his stat totals will prove. It also doesn’t hurt that Vrbata is a right-handed shooter, a quality that any ideal Sedin linemate should possess. 6. What are your thoughts on management last year compared to this year? Don’t hold back! Ah, where do I start? I had guessed with the hiring of Tortorella, the Canucks would either cash in big or would be a nuclear meltdown – no middle ground. The first half of the season went well with Tortorella, but it was the second half where everything came apart and it was clear that his system wasn’t going to work for the Canucks, never mind his reputation and attitude. But it was after Torts was let go when the stories emerged about his lack of communication with players and other Canucks personnel, along with his disappearance from game-day skates. As for Mike Gillis, I think he wore out his welcome with the way that he mishandled the goalie situation, along with several other questionable trades following the 2011 Stanley Cup run. The new management appears to be a breath of fresh air. I truly believe that Trevor Linden was brought in to prop up the sagging brand and convince season-ticket holders not to walk away. Jim Benning appears to be a true hockey man, a general manager who is a scout at heart who can help the Canucks with something they have not been traditionally good at, which is finding young talent. And Willie Desjardins is a lifetime coach who is deserving of the opportunity given to him, not to mention a coach whose up-tempo style and open communication approach better favors the Canucks. 7. It is time to put your fantasy hockey hat on. 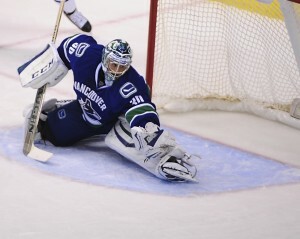 What projections do we expect from Ryan Miller and why? As a Canucks fan, I would love it if his 1.95 GAA and .927 SV% would hold up. But I believe that a 2.40 GAA and .920 SV% are within reach, along with 30 wins and 5 shutouts. The win total will obviously improve from his last two seasons in Buffalo. The Canucks are one of the stronger puck possession teams in the NHL and give up fewer shots per game than most teams, which should ease his workload in each start. 8. Will the Sedin twins bounce back to the 70-80 point range? Please show your work. Well for starters, the Sedins should improve on last season’s point totals (50 points in 70 games for Henrik, 47 points in 73 games for Daniel). If you factor in the injuries from last season and assume that the Sedins play a full season, add 7-8 more points to their total. Flip back one season and Henrik had scored 45 points in 48 games, while Daniel scored 40 points in 47 games. If you assume that they can return to that level of production (an average of about 0.9 points per game), the Sedins could return to just over 70 points per game. I think 80 is a little high, but 70 is within reach. For what it’s worth, they’re off to a good start (7 points for Daniel, 6 points for Henrik). 9. Bo Horvat was recently sent down to the AHL. What does he need to work on while down in the minors? I think he just needs to go down to the AHL to play and get icetime, plain and simple. Horvat missed the start of the season with a shoulder injury, so the AHL should be a good test for him to find out where he stands in the Canucks’ organization. He’ll be back in Vancouver for his nine-game audition before the Canucks decide whether to send him back to junior. His two-way game is already strong, so perhaps solidifying his scoring ability will be a priority. 10. Which teams concern you most in the Pacific Division? That’s easy: the California teams. The Kings, Ducks, and Sharks all play a physical brand of hockey, one that the Canucks have had trouble against in the past. The Canucks’ head-to-head matchups against this group of three were very one-sided last season. Sure, wins against Edmonton and Calgary early in the season are great, but let’s see how the Canucks fare against the big boy teams. 11. Who should we keep an eye on as far as prospects for the Canucks? 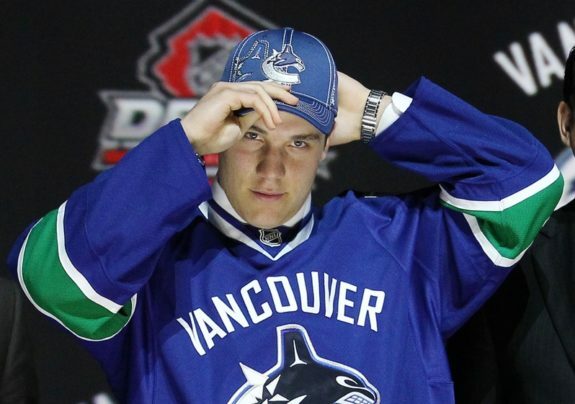 The aforementioned Horvat is probably the Canucks’ strongest prospect at the moment. Two other players to keep an eye out for possible callups this season are Nicklas Jensen, who was up briefly with the Canucks last season, and Hunter Shinkaruk, who has impressed in his two Canucks training camps. Other prospects worth mentioning are 2014 first-round picks Jake Virtanen and Jared McCann, who are both back in junior this season, along with former first-round pick Brendan Gaunce and last year’s OHL goal leader Dane Fox. On defense, Jordan Subban had a great camp, and Frank Corrado could crack the roster for good this season. In goal, we could be talking about Thatcher Demko as the starting goalie in five years, unless Jacob Markstrom can turn his career around. But it’s fair to say that the Canucks’ pipeline of prospects is better than it was even two seasons ago. 12. Where do the Vancouver Canucks wind up finishing in the Pacific? Do they make the playoffs? I’ll say that the Canucks will finish fourth in the Pacific, behind the three California teams, of course. Whether they make the playoffs will depend on how strong the Central Division is. I honestly think it’s 50/50 right now whether they make the playoffs. If the Canucks played in the Eastern Conference, yes. In the Western Conference, I’m going to predict that they finish 9th and fall just short. Up next, we head for California! Expect it to get a little crazy with the San Jose Sharks.